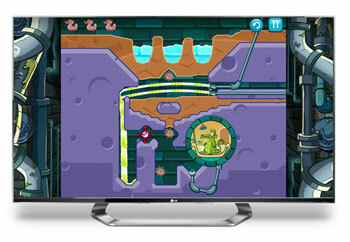 LG Electronics has let word out of yet more products it plans to demo at the CES 2013 in Las Vegas later this month, including its first-ever CarbonFree-certified OLED TV, and a variety of top new games for its Cinema 3D Smart TVs. The new OLED television is just one of six new products from LG that have received CarbonFree certification from the Carbonfund.org Foundation, along with its high-end Optimus G smartphone, a washing machine, vacuum cleaner, computer monitor and refrigerator. The South Korean manufacturer hasn’t given much away about the specs of its latest OLED display, simply stating that the HDTV was subjected to a comprehensive lifecycle analysis test in order to determine its carbon footprint, covering its manufacturing process, shipment, usage and final disposal to assess its total effect on the environment. LG’s Carbon-Free OLED TV will be on display at its booth at CES next week, where we will learn more about the device’s capabilities, and perhaps, just perhaps a possible date when the display might go on sale in the United Kingdom. By the time LG’s eco-friendly OLED TVs finally hit the shops, we can at least count on having a wide range of interactive games to play on them. The company has just announced the addition of seven new game titles to its Smart TV apps lineup, including The Sims FreePlay, Where’s My Water, Mini Motor Racing, Air Penguin and many others. Of the new games, one of the most eagerly anticipated will surely be Disney’s Where’s My Water, which has already become one of the most downloaded games of all time, shooting to number one spot in more than 90 countries. The SimsTM FreePlay meanwhile, is the newest title in the popular The Sims series, which has already sold more than 150 million copies globally to date. Both games make extensive use of LG’s innovative Magic Remote controllers, while they can also be played using a smartphone or tablet if the user downloads a special app. Mini Motor Racing will also generate lots of excitement as one of the first racing games on the connected TV platform to have been especially optimised for the third dimension. Ideally suited for two players, Mini Motor Racing utilises LG’s FPR passive 3D technology to display the action in 3-D, doing away with the need to play in the traditional split-screen mode. These games, plus several other top titles will all be demonstrated for the first time on LG’s Smart televisions at CES 2013, which is now less than one week away!